Why Rent An Ultra Portable Projector? As technology continues to advance, our technology products continue to get smaller and smaller. Today, many projectors weigh in at 4 pounds or less and are capable of producing high-quality presentations. Some ultra-portable projectors are so small that they can fit in your pocket, also known as pocket projectors. These projectors have great mobility and can be used anytime, anywhere, without the bulk and hassles of the traditional projector. The newest ultra portable projector rentals can weight as little as 1.5 pounds! Even more amazing is the quality of the picture. You would assume by the size that these projectors are used on a small scale and for pleasure, but thats incorrect. These projectors are very capable of making great presentations. They can have a battery life of almost 3 hours and project images that range from 12" to a whopping 63" without affecting the picture quality. 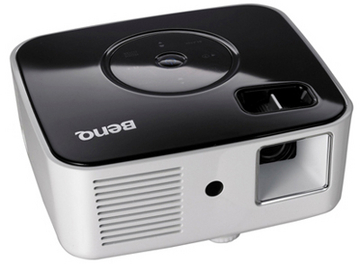 The Joybee GP1 Mini Projector is the newest product from BenQ. It is a 5.4 by 4.7 by 2.1 inch mini projector which makes it great for taking it on the road. The GP1 offers a full anamorphic DVD-ready 858x600 resolution, 100 lumens light and a 2000:1 contrast ratio. It has a dynamic keystone correction feature for precision picture tweaking as well as features for high altitude and ceiling-mounted modes, wall color and picture temperature adjustments, numerous picture calibrations, digital zoom and multi-lingual menus. This mini projector is great for traveling. Its small size makes it easily portable and allows it to fit into most bags or even your laptop case. For all the details on the Joybee GP1 Mini Projector read its full post on The Projector Blog. 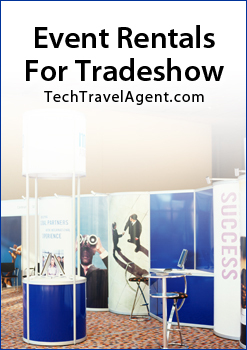 Ultra portable projectors are a great choice for your next business presentation projector rental need. - Ultra Projector Portables are so small you can hold them in one hand. - Nano projectors can be embedded in a range of different products, including cars and passenger airliners as virtual displays for entertainment systems, inside mobile devices (cellphones, PDAs, MP3 players, laptops, etc. ), and as hidden projectors embedded in walls and ceilings for advertising and displaying virtual images. - The nano projector engine is based on a technology called Laser Projection. In this technology, a laser-based light source is used as the illuminator for a micro display (0.24" diagonal) that acts as a transparent dynamic slide generating the image to be projected. This light is then magnified trough a projection lens and is projected on a screen or wall. 1. Portable video projector for use with PMPs (portable media players) and other mobile devices. 2. Cell phone / PDA / laptop projector for use as an on-the-go, small, light video/photo and presentation aid. Both integrated and stand-alone. 3. Car / passenger plane projector for use as a replacement for expensive, breakable LCD screens. The Optoma EP729 has XGA resolution (1024x768), weighs just 2.2 pound and puts out an amazing 1600 ANSI Lumens. Bulb life is estimated at 2000 hours. This sub-micro projector throw distance ranges from 5 to 30 feet and has VGA, s-video, composite and usb connections. Include with the Optoma EP729 projector is a six foot AC power cord, a 15-Pin VGA to 15-Pin VGA cable, RBG SCART to VGA Adaptor, Composite video cable, S-video cable and remote control. 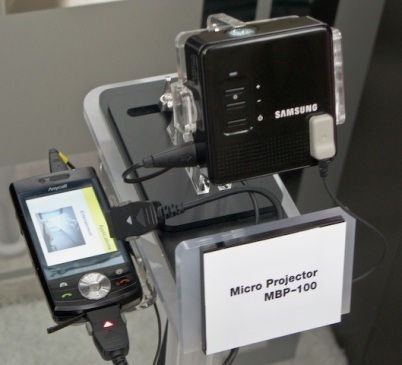 The Samsung MBP-100 Micro Projector is only a 10 lumen projector. This prototype is not ready for prime time, but as technology improves, products such as these will be highly popular with anyone needing to make a presentation to a small group of people. 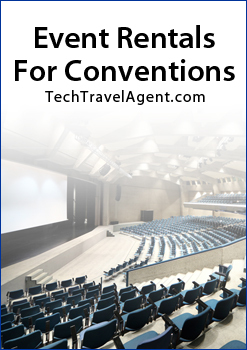 Currently we do not have Ultra Portable or Micro Projectors in our rental inventory.